A Campaign Hat is a broad-brimmed felt or straw hat, with a high crown, pinched symmetrically at the four corners to form the ‘Montana crease’. The Campaign Hat is associated with the New Zealand Army, the Royal Canadian Mounted Police, the World War I United States Army, US military drill instructors, state police forces, park rangers, Smokey Bear, Boy Scouts, and many others. The Campaign Hat is occasionally referred to as a Stetson, after the hat manufacturer who made them in the late 19th century. The Campaign Hat also should not be confused with a slouch hat. The Campaign Hat’s origins can be traced to the 1840s when army troops posted in the west took to wearing civilian hats which were far more practical than the shakos or kepis then in vogue with most western armies. The name started to be used after the 1872–1876 regulations introduced a black felt hat – which could be drab after 1883 – for fatigue use derived from the types popularised during the American Civil War. During the Spanish-American War the standard central crease on the crown was found to be impractical as it tended to hold the rainwater from the frequent tropical downpours. Many soldiers reshaped the crown to form a pinched ‘Montana peak.’ The army officially adopted the peaked design in 1911. 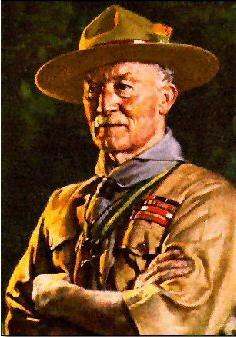 The Campaign Hat is closely associated with Robert Baden-Powell who picked up the hat during an African campaign in 1896 from an American scout Frederick Russell Burnham who first taught him woodcraft. The Campaign Hat was later introduced for the South African Constabulary and the Boy Scouts. Through the World War I era, the Campaign Hat worn by American soldiers was fairly soft. Those worn by the United States Army’s General officers had a golden cord around it, whereas other Commissioned officers had a golden-and-black cord around their hat. Field Clerks, as well as their post-war successors the Warrant officers, had a silver-and-black cord, while other ranks had cords in their branch-of-service colours. The United States Marine Corps had the Eagle, Globe, and Anchor badge in black at the front of their campaign hats; its officers had an additional golden-and-scarlet cord around their hat, whereas its other ranks had none. By the 1930s the felt was made very stiff with a permanently flat brim. Due to the frequent wearing of helmets in France in World War I, most troops received a copy of the French Bonnet du Police that became known as the overseas cap. In 1942 the campaign hat ceased to be issued generally, but it was still commonly found in the Pacific theatre for much of the war, and was the trademark of General Joseph Stilwell. Cheap felt versions of the Campaign hat are available for fancy dress use.